If the idea of a fishing trip around gorgeous Topsail Island in North Carolina sounds exciting to you, then you can smile. Cape Fear Coastal Charters fishcarolinabeach.com is a reputable company that provides offshore and inshore fishing outings for groups on Topsail Island. If you want to enjoy fishing and fun in the sun with coworkers, close pals or family members, then Cape Fear Coastal Charters makes a great option for you. Both half day and full day fishing trips are available. Cape Fear Coastal Charters’ fishing excursions are operated by Captain Owen Sewell, a seasoned pro who has more than 40 years of fishing experience under his belt. Not only does he have an extensive background in fishing, but he excels at it. 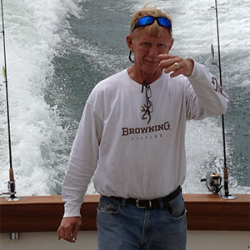 As far as fishing charters go, Captain Owen’s fish catching rate is unrivaled. He’s a native of the North Carolina coastal region and has never lived anywhere else. Because of that, he’s extremely well-versed in all of the ins and outs of the area. Captain Owen emphasizes the importance of quality customer service. His aim is to make sure that all guests enjoy themselves during their fishing trips. Not only does he come 100 percent prepared with all the essential fishing components, but he even provides guests with the pure convenience of a restroom. All guests have to do is show up with their own sunblock, snacks and coolers. Not bad at all. When you go on a fishing trip with Captain Owen and Cape Fear Coastal Charters, you get the opportunity to catch a wide assortment of fish. Offshore fishing charters frequently see mahi mahi, while inshore charters frequently see flounder. If you’re interested in lemon sharks, Spanish mackerel, gulf flounder, yellowfin grouper, bull sharks, horse eye jacks, red drums, red snappers, bonefish, brook trout and great barracudas, to name a few examples, you just might have a blast with Cape Fear Coastal Charters. 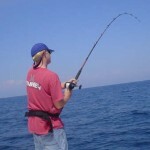 At Cape Fear Coastal Charters, several types of fishing are available, too, notably bottom fishing, trolling and casting. Captain Owen is a big fan of fishing offshore. Bottom fishing specifically is a favorite of his. When you go on fishing trips with Cape Fear Coastal Charters, you can experience comfort, enjoyment and excitement all wrapped up into one. Fishing is supposed to be a serene, peaceful and soothing activity, after all. With Cape Fear Coastal Charters, you can experience the joys of a top-notch crew, a vast array of fish, lovely scenery and excellent company. Not many things can be better than that. If you want to revel in the beauty and diverse fish of picturesque Topsail Island, you can reserve a fishing charter with Cape Fear Coastal Charters via the Internet. You can also call our company for additional information. When you turn to us for your fishing charter needs, you receive impeccable service at budget-friendly prices.